6sqft’s ongoing series The Urban Lens invites photographers to share work exploring a theme or a place within New York City. In this installment, aerial photographer Peter Massini shares a series of warm-weather shots. Are you a photographer who’d like to see your work featured on The Urban Lens? Get in touch with us at [email protected]. Last summer, multi-disciplinary photographer Peter Massini shared one of his aerial series with 6sqft that captures NYC’s hidden rooftop patios and gardens. 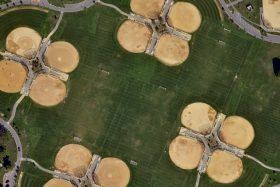 In his latest collection, he’s taken a look down at the city’s more publicly accessible green spaces–parks, ballfields, lawns, and more. Though we’ve seen many of these locations, like Central Park and Arthur Ashe Tennis Center, more times than we can count, we’ve never experienced them like this before, from 1,500 feet in the air. By shooting from a helicopter, Peter is able to get a unique perspective on recreation in the city and just how vast some of these locales actually are. Peter Massini is a multi-disciplinary photographer, working on architecture, landscapes, and graphic patterns. But his specialty is aerial views, for which he hangs from the open door of a helicopter on almost a daily basis. 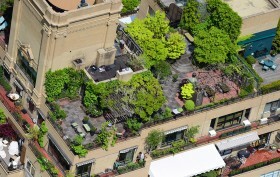 6sqft got a look at one of his recent aerial collections of New York City’s rooftop patios and gardens that he shot from 1,500 feet in the air. These hidden oases reveal an entirely unique mashup of concrete jungle and green space. “What led me to shoot these from above was my interest in true green roofs and their benefits for the eye as well as the environment,” Peter told us.